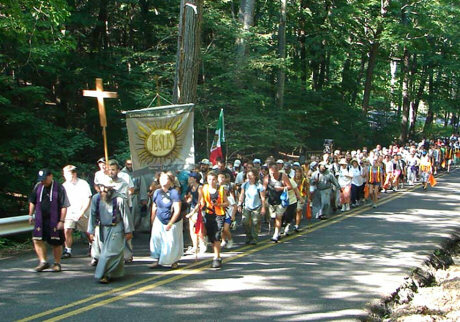 Audio is from conference during Walking Pilgrimage to American Czestochowa Shrine in Doylestown, PA…Father Anzelm and members of Corpus Christi parish family have been particpating in the pilgrimage for a number of years now. Buffalo, New York – Corpus Christi Church is fast becoming known as a destination for great music. This year’s Dozynki Polish Harvest Festival underscores the parish’s well-deserved reputation by featuring a wide range of musical performances. The festivities kick off on Saturday, August 23 at 1:00 p.m. with Al Kania’s Polka Smile, Eastern Style. Kania, an accomplished trumpeter in jazz and polka circles, will lead a band that features Gino Kurdziel on bass. Kania’s belief in putting together a quality orchestra and presenting Polish lyrics in their original format will be on stage until 5:00 p.m.
At 7:00 p.m., Dyngus Day favorites Those Idiots will take the Dozynki stage for the first time. Those Idiots are a high energy group that attract young and old. A nine piece orchestra with a large horn section, their style is hard to pinpoint, but one that leaves the crowd dancing and wanting more. Those Idiots will play until 11:00 p.m. Between bands, Buffalo’s Best Homemade Pierogi Contest will take place under the big tent at 5:30 p.m. All amateur pierogi makers are invited to enter and all are invited to observe the judging. Pierogi and a wide variety of food and beverages will be available both Saturday and Sunday.